CASE is YOUR voice. As you read this article this Monday morning, 80 of your colleagues from 23 states will be hearing from colleagues at NSBA, CEC, NCLD, NAME and OSEP in formal presentations and will be networking with colleagues from at least 15 additional professional associations at the 12th Annual CASE Educational Legislative Leadership Summit being held in Alexandria, VA. If you have never participated in this professional development event, you need to mark your calendar to attend next year. There is so much energy and knowledge the air is not only hot but it crackles! You can download the CASE Talking points for our Hill visit so you too can continue the message to your Senators and Representative by clicking here or by going to the CASE website. CASE participants will be getting great information and then on Tuesday, July 15, we will be heading up to the Hill to speak to Senators, Representatives and their staff members. We will be your voice. Please help us better represent you by participating in our on line discussions on Twitter and Facebook and through our various surveys and polls! One of the things CASE leadership is always trying to do it to take advantage of the wealth of knowledge, experience, and wisdom that are in the same location when we have CASE functions! So in that light, on Wednesday morning after we debrief our hill visits and have heard about what is "trending" in special education, Policy and Legislative chair, Phyllis Wolfram (MO) and past president, Laurie VanderPloeg (MI) will be leading a discussion on "Reinvent" Special Education. Both of their states have started looking at this concept as have several other states. 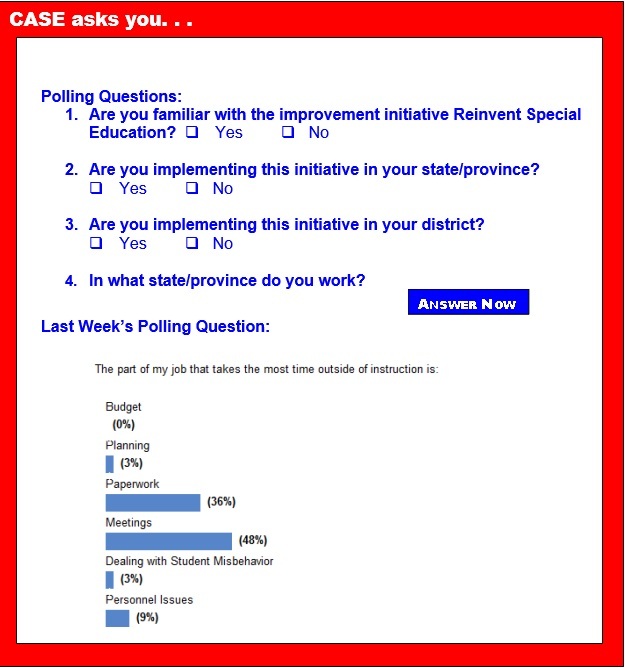 In our weekly poll, we are asking you to give us your vantage point on this movement. Please answer those questions. You will notice that we indicate state or province. We are interested in knowing if this movement has erupted in Canada, too! Thanks for participating in this Poll! For 25 years, educators have relied on The Special Educator® for guidance on creating special education policies and making decisions that are educationally and legally sound. Brought to you by the trusted experts at LRP Publications, this twice-monthly newsletter gives you: analysis of IDEA, ADA and Section 504; ready-to-use compliance strategies; plus lessons from cases so you can avoid actions that lead to litigation. •	Choose mailed or emailed issues. •See more details and subscribe today! As schools recess for the summer months, the U.S. Department of Education is considering whether to provide extensions to over two dozen states that will see their ESEA waivers expire this summer. Although it is well documented that lead exposure lowers children's IQ, we know little about its effect on their behavioral and emotional health. Now, a new study shows that emotional and behavioral problems are apparent even at relatively low levels of lead exposure in preschool children, and they go up in line with rising blood lead levels. Writing in the journal JAMA Pediatrics, Dr. Jianghong Liu of the School of Nursing at the University of Pennsylvania, Philadelphia, and colleagues report how they analyzed links between blood lead levels in over 1,300 Chinese preschoolers and behavioral and emotional problems, such as showing signs of being anxious, depressed or aggressive. Is free play essential for learning? Dr. Marilyn Wedge, is a family therapist and the author, writes: "Three years ago, I wrote a blog here at Psychology Today called "Play and the Child's Sense of Self" in which I argued for the importance of free play in the life of a child. It turns out that having ample opportunity for free play not only has psychological advantages for a child; it has educational advantages as well." New research discovers that adults who have dyslexia are much more likely to report they were physically abused before they turned 18 than their peers without dyslexia. Researchers at the University of Toronto and the University of North Carolina School of Medicine in Chapel Hill found that 35 percent of adults with dyslexia report they were physically abused before they turned 18. In contrast, seven percent of those without dyslexia reported that they had experienced childhood physical abuse. The Obama administration will announce plans to enforce a long-ignored federal mandate: a decade-old requirement that states give students of all ethnic and socioeconomic backgrounds equal access to good teachers. The new initiative, called "Excellent Educators for All," aims to bring states into compliance with a teacher equity mandate in the No Child Left Behind Act, the George W. Bush-era law that requires states to reward and punish schools based on standardized test scores. Days before most U.S. states' new fiscal year begins, 40 states have passed budgets that boost spending and dedicate extra funding primarily for education, according to a brief by the National Association of State Budget Officers. But in many states spending increases and tax cuts are not as dramatic as their governors proposed this winter, due to softer-than-expected revenue, NASBO found. Typically, governors suggest budgets in January that legislatures use as starting points to negotiate. There are 6.5 million special-education students in the U.S. today, and most are falling further behind their peers under Common Core standards. "The latest government figures show that the dropout rate for students with disabilities is twice that for non-disabled students," NPR's Claudio Sanchez reported. "Two-thirds of students with disabilities are performing well below grade level in reading and math. By the eighth grade, that figure rises to 90 percent." Secretary of Education Arne Duncan responded to the rising problem of special education failing under Common Core in a press conference, expressing his disregard for schools claiming it's enough that they are following the standards of Common Core in their special-education classrooms. A new study from researchers in our Department of Psychology has revealed that understanding attention deficits in adults with dyslexia may help develop new techniques for reading and writing. Dyslexia is well known as a condition that impacts on visual language processing, but recently a number of studies have discovered that it is accompanied by deficits in attention and perception. As part of the study, just published online via the journal Neurocase, researchers monitored how adults with and without dyslexia responded to an "interference test." Their results revealed large differences in terms of attention deficits for adults with dyslexia. Cyberbullying creates fear among students about being victimized at school, a recent study by Sam Houston State University found. While traditional bullying still creates the most fear among students, cyberbullying is a significant factor for fear of victimization at school among students who have experienced bullying or disorder, such as the presence of gangs. The fear from cyberbullying is most prominent in minority populations. "It cannot be overstated — online victimization has offline consequences, and those consequences may have a number of negative effects for students, including fear of victimization," said Ryan Randa, Assistant Professor at Sam Houston State University, College of Criminal Justice. It's an interesting question: What will something look like or be able to do 5, 10 or 20 years down the road? Classrooms and curriculum are no different. With education stakeholders calling for reform and a stronger focus on measuring 21st-century skills, classrooms and curricula must change. At the White House Maker Faire recently, where Obama invited "makers" of all ages to display their creations, the president investigated a robotic giraffe, a red weather balloon and shot a marshmallow cannon made by a student. With so much fanfare and media attention on the event, some educators are hopeful that the idea of tinkering as a way of learning might finally have made it back to the mainstream. But will the same philosophy of discovery and hands-on learning make it into classrooms? There are 6.5 million special-education students in the U.S. today, and most are falling further behind their peers under Common Core standards.